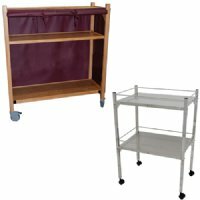 MRI non-magnetic oak and stainless steel carts. These MRI utility carts work great for moving you coils or other equipment in and out of the MR suite. The non-magnetic carts are safe to use inside your MRI room. These carts are non-magnetic and come in many sizes and shelf combinations to suit your needs. Custom size carts are available upon request. Browse these categories under "MRI Carts"